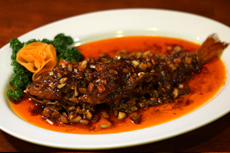 Enjoy more at Chinese cafe Eight! Finding it difficult to choose what to order? There are over 300 dishes waiting for you. Here are some examples you can follow to enjoy more with us. Please look below as a reference if you visit us for the first time. Then explore you own way to enjoy it. 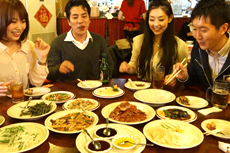 Please order Peking Duck together with your first drink. It takes time to roast the duck carefully. ※Sometimes you may get the duck much faster than expected, because we prepare ducks in advance for peak dinner time. Second, order some small starters (all for \280〜). It would be nice if you order 2 starters for each. (※Female guests might get full only with these…) You can take time to select other dishes such as meat, seafood, vegetables or dim sum while eating those quick starters. Our Peking Duck will capture your heart. Now getting high with enjoyment. You will be more excited when the Peking Duck comes on your table. Please enjoy the fleshy duck! If you would like to order more, let’s go for ordering fried rice. You will see that your table is full of dishes at this time. But do not worry about the check. You will be pleasantly surprised at how reasonable it would be! Please select dishes following “Red pepper” symbols on a menu. Please be aware of a difference because we rank the level of spiciness regarding Chinese standards. Generally “Very hot” in Japan corresponds “A little hot” here. It is your choice whether you order hot one or not. But please do not complain that “Oh this is TOO hot”…. Can you distinguish between them? 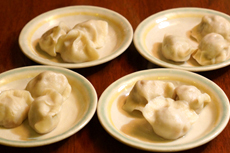 A guest taught us how to play “Russian roulette” with boiled dumplings. 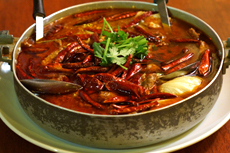 Order many boiled dumplings including “Red pepper boiled dumplings”. You never know which ones are the hot dumplings because they all look the same! Who will (un)fortunately pick the hot one…? Take a look around the dishes being served near your table. You can point them out and order. Try dishes that you have never tasted before and add them to your list of favorites. You have new discoveries every time you see the menu! Visit Chinese cafe Eight on Facebook. Message us how you enjoy our dishes!